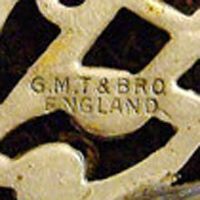 After opening my site in 2004 I soon ran into the first mark that really had me stumped, it was found on a cannister set purchased in the late 1930's to early 1940's and it was simply marked with a golden 'G.M.T. Co. INC. THURINGIA' and had golden 'daisy' in the center. The first thing that got me was that it looked a little like a mark used by Stouffer which had its own decorating works and was involved in the import/export business. 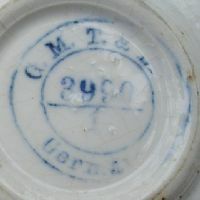 Compared with the 'GMT' mark it showed a very similar typeface, was the same size and had a 'floral' note in the middle. Both can be seen together in the marks section below. 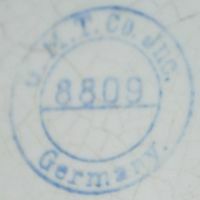 The second thing about this mark was more a legal matter because according to German laws, the use of foreign company forms in names was prohibited (until the turn of the 21st century) meaning that for example foreign company name additions like 'Incorporated (inc.)' or 'Limited (ltd.)' were not allowed. So the name additions 'Inc.' or 'Bro.' 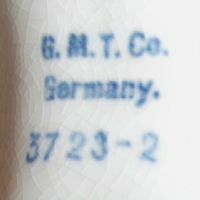 clearly indicated a foreign company and the additions 'Thuringia' or 'Germany' only stated where the product was originally made so everything pointed into the direction of 'G.M.T.' not being a manufacturer but rather some kind of non-German import business and/or shipping company. Some research followed and I found an otherwise unmarked German oil cruet with 'Blue Onion' decoration that was dated early 1900's to 1920's and carried a 'G.M.T. Co. Inc. Germany 4511-1' stamp on the bottom. It took some time until I finally found an egg-coddler that showed the 'G.M.T. Co. Inc.' mark together with the well-known impressed 'RMR' mark of 'Max Roesler Rodach'. This item was the first that carried an original manufacturer mark and was further proof that 'GMT' was an importer. 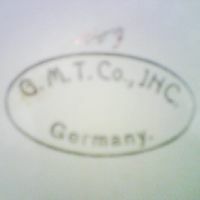 That also had me thinking about the 'GMT' company size and renown, because if 'GMT' had not just simply add-marked his items after buying them, they would have had a real contract and Roesler was known to be picky, so they must have been well known at that time or able to offer good references. The next item reported was a knife and fork with a mark on the knife showing 'G.M.T. Austria', so they also imported metalware or at least cutlery. That item was soon followed by a set of metal cookie cutters made in Czechoslovakia by 'G.M.T. Co. Inc.' and then Diane Vaulner pointed me into the direction of a cast iron 'G.M.T. CO. INC.' grater (picture included below). All together that was enough proof that the company was active in various areas of interest and countries: no doubt now, 'GMT' was an import company. Regardless of the information received the location or home town remained unknown and also I wondered only one 'manufacturer-marked' item so far had been found. 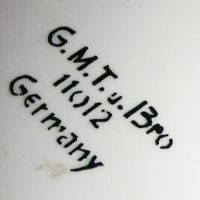 This changed in February 2007 when I received two hints at once when an eBay user presented me with some pictures showing a mark from the 'Villeroy & Boch' factory in Septfontaines (Luxemburg) together with an impressed GMT mark. As the mark was impressed (which is only possible during manufacturing) it was proof that a well-known manufacturer made business with GMT directly. But the second hint was the greatest find up until now as the full mark showed 'GMT & Bro., N.Y' and finally gave the mysterious company a home town: New York. 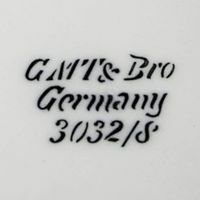 The last additions to this page came from Janice Schiltz who in June 2009 submitted info on a tea strainer with a nicely decorated handle that showed 'GMT & Co.Inc., England'. Then Cristine of Ashby Antiques (July 2009) sent me a few pics of a water-powered metal & porcelain hot server with stamped oval mark shown below in the marks section. Finally Candy Warren in July 2009 informed me that she owns a springerle rolling pin that has 'G.M.T. CO. INC.' above 'N.Y.' imprinted into the wood by the handle. 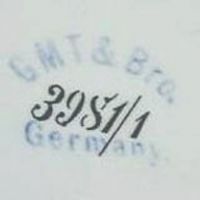 Juanita Lewen in October 2009 then provided pictures of a second grater type marked 'G.M.T Co. Germany' and carrying the brand name 'SUPERIOR', another item from around 1920. And finally, also in October, Carol N. provided information on what appears to be a baby spoon with the stamped mark 'G.M.T. Co. INC. FRANCE'. The above is the unchanged page content used until 2010, just to show how close I was to the solution all the time. Now that I can finally present the company behind G.M.T., I wonder why I did not recognize the oldest kitchenware company and pioneer of the kitchen gadget field in the USA much earlier - but then, everything is obvious at hindsight! Gustav M. Thurnauer in 1883 established business in a small store located at 84 Duane Street, his product range covering everything from wooden rolling pins to cast-iron meat grinders and being an instant success. His business model was simple - sell durable, quality goods for less than other suppliers charged and always make sure that customers find what they need. He even offered a small selection of books with Fairy Tales, something that could keep the children occupied whilst their parents viewed the goods. Knowing the quality provided by German manufacturers, Thurnauer at first strongly relied on German goods alone: carving knives, cutlery and pocket knives from the famous workshops in and around the city of Solingen, the well-known Stadelmann lamps and gas burners, dishes and casseroles from Villeroy & Boch, just to name a few. Thurnauer covered a special, but totally under-served market: it was the first store that fully concentrated on kitchen utensils and everything else required in a kitchen, in various forms, shapes and sizes. With other words: you name it, Thurnauer had it. And business flourished accordingly, eventually requiring a larger store. Shortly before G.M.T. moved to 66 Reade Street in 1887, Otto Thurnauer joined his brother as co-partner, and the newly-established firm soon occupied all four floors (a total of 1,260 m²) on 66-68 Reade Street. An idea Gustav M. Thurnauer picked up earlier should soon revolutionize house work: small metal thingamajigs that did not cost much, but made work a lot easier - kitchen gadgets. What is completely normal for us today, like butter curlers, apple slicers, aspic cutter sets, cookie cutters, was more than welcome innovation. And even if the real craze started during this period, it would still take a few years before a further innovation caused this business segment to really pick up speed. Anyway, the business of G.M. Thurnauer & Bro. eventually relocated to 83 Worth Street. The smaller store had included an impressive array of storage jars, butter vats, hot plates and other ceramic goods; the larger store allowed further expansion of the product range in this sector, as can be seen when one takes a look at the dozens of items still around from that period. 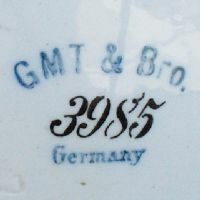 On July 31st 1908, the co-partnership between Gustav M. Thurnauer and his brother Otto was dissolved after Otto decided to drop out of the company again; the business name however was continued as G.M. Thurnauer & Bro. at first. Business development so far had been already quite impressive, but a further big leap was just around the corner. In 1913, the British steel manufacturers (located in Sheffield, my home town) introduced something that should change the industry forever: chromium alloy steel, today commonly known as "stainless steel". A minor alteration in the process, a small change of formula ... and rusty scissors, knives, cutters and such were history. The impact on the market was tremendous, and G.M.T. staff soon started comparison presentations, something that was continued until around the mid-1950s. Even the "simplest housewife" (their words, not mine) soon recognized the advantages of stainless steel products, and while other retailers tried to earn a fortune at first, Thurnauer barely increased prices. Sales went through the roof, and marketing via the initials 'G.M.T.' soon shifted from "Good Merchandise Thurnauer" towards "Gadgets Make Time". Thurnauer soon decided to change the business form once again. But that is just about all that is known from here onwards - I found no further information on company development, advert examples, etc., which is not unusual. We often forget that not everything is available in digital form or even correctly indexed when one looks things up. Anyway, one of the other things I found was the mentioning of a 14-page booklet named 'Fashions in gadgets', published by G.M. Thurnauer Co. Inc. on November 15th 1964. Take note that this mentioning still quotes the company name as G.M. Thurnauer Co. Inc., whereas some sources from the same period merely mention the shorter G.M.T. & Co. only. I assume that the G.M.T. & Co. marks were introduced around 1960 before the company during the 1970s decided to switch to a simple 'THURNAUER' marking. Sadly, that is all I can say until now; the Thurnauer business apparently was later sold to - or taken over by - the Meyer Corporation. I would be extremely happy if somebody could provide further information on the whole history or overall development of G.M.T. (and its sale to the Meyer Corporation). Text info, scanned adverts, invoices, bills, newspaper clippings, everything - I have spent so much time tracking this manufacturer down, it would really be a shame if I would have to leave this page 'unfinished'. As for the various numbers used, it seems that they mostly represent company-internal item/mold numbers with the occasional decoration ID number (e.g. '3985/3' and '3985/5' are the same mold but show different decorations). In some cases however, that numbering scheme was disrupted. If you take a look at the marks presented below, you will find one mark that shows a stand-alone '1482' as well as 'DEC. 3243' ('DEC.' was a common abbreviation for 'Decor/Dekor' (engl. "decoration type/name")). I assume that the manufacturer which made that item for G.M.T. used his own item number '1482' as he did not want to disrupt his own production numbering system, and then applied the G.M.T. item number '3243' via a pseudo-decoration-number for this specific order. Also hold in mind that the item/mold number has nothing to do with age - some items were sold for decades. The old number (which apparently was also the internal stock number) did not change, even if the corresponding mark form (Bro. / Co., Inc.) did, hence one can find multiple examples of item numbers appearing in both main marking periods. 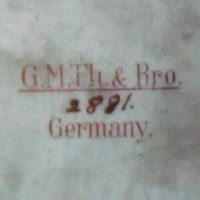 Used between 1887 and 1914, 'G.M.TH. & BRO. GERMANY'. Hand written addition '2881' in green, item was a small juicer. 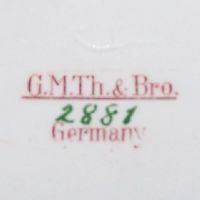 Used between 1887 and 1914, 'G.M.TH. & BRO. GERMANY'. Hand written addition '2881' in red. 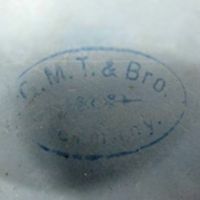 Used between 1887 and 1914, 'G.M.TH. & BRO. GERMANY'. Hand written addition '2884' in red. 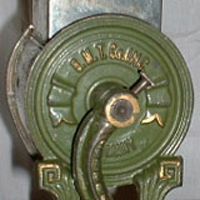 Used between 1887 and 1914, simple 'G.M.T. & BRO.' 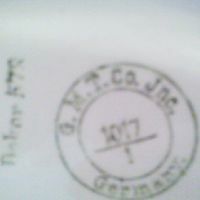 above 'GERMANY' without additional mold or item number. 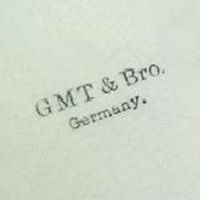 Used between 1887 and 1914, simple 'G.M.T. & BRO.' 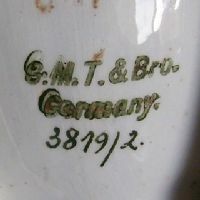 above 'GERMANY' with hand written addition '3045/2.'. 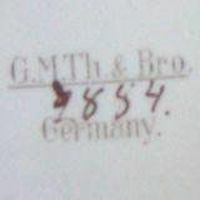 Used between 1887 and 1914, simple 'G.M.T. & BRO. 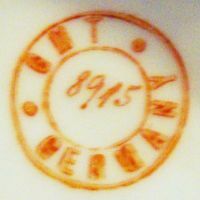 GERMANY' with hand written number addition '3819/2.'. 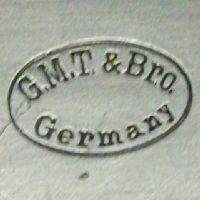 Used between 1887 and 1914, simple 'G.M.T. & BRO.' 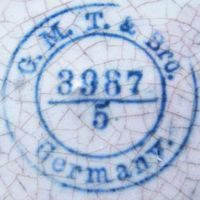 above 'GERMANY', here with addition '3032/8'. 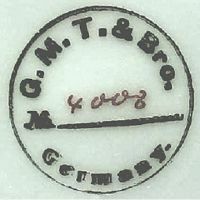 Used between 1887 and 1914, simple 'G.M.T. u. BRO. ', where 'u.' is the German abbreviation for 'and'. '11012' above 'GERMANY'. Used between 1887 and 1914. Impressed 'G.M.T. & BRO. 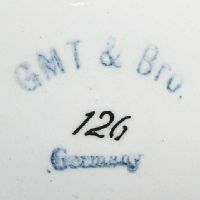 N.Y.', item made at the Villeroy & Boch factory in Septfontaines (Luxembourg). Used between 1887 and 1914. Impressed 'G.M.T. & BRO. ENGLAND'. Used between 1887 and 1914, simple 'G.M.T. & BRO. GERMANY' with hand written addition '126'. Used between 1887 and 1914, 'G.M.T. & BRO. 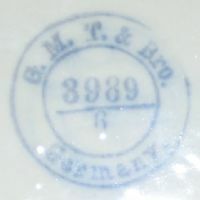 GERMANY', with stamped mold or item number addition '3981/1'. Used between 1887 and 1914, 'G.M.T. & BRO. 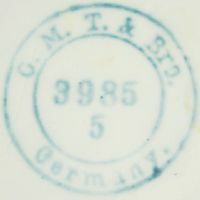 GERMANY', add-stamped mold or item number '3984'. Used between 1887 and 1914, 'G.M.T. & BRO. 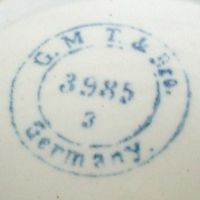 GERMANY', with additionally stamped mold or item number '3985'. 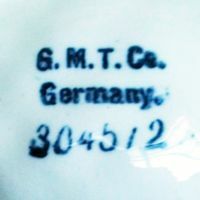 Used between 1887 and 1914, from a metal & porcelain server: 'G.M.T. & BRO. GERMANY'. 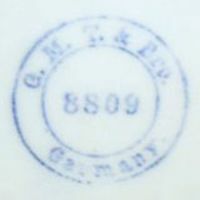 Used between 1887 and 1914, another mark, this time from a metal plate, not impessed as deep as the previous example and filled with blue color. Used between 1887 and 1914, 'G.M.T. & BRO. 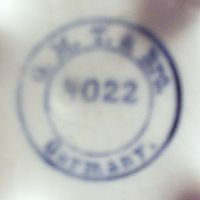 GERMANY', with handwritten mold or item number '4008'. Used between 1887 and 1914, 'G.M.T. & BRO. 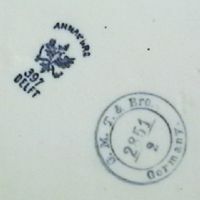 GERMANY', number '2851' over additional '2' next to Annaburg manufacturer mark and '397 DELFT'. 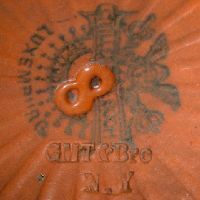 Used between 1887 and 1914, 'G.M.T. & BRO. GERMANY', another '3985' (with additional '3' underneath). Used between 1887 and 1914, 'G.M.T. & BRO. GERMANY', also '3985' (with additional '5' underneath) as seen before but this time in round form. Used between 1887 and 1914, 'G.M.T. & BRO. 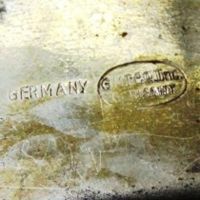 GERMANY' and mold or item number '3987/5'. Used between 1887 and 1914, 'G.M.T. & BRO. GERMANY', '3989' with additional '6' underneath. Used between 1887 and 1914, 'G.M.T. & BRO. GERMANY', '3990' with additional '1' underneath. Used between 1887 and 1914, 'G.M.T. & BRO. GERMANY' and item number '4022'. Used between 1887 and 1914, 'G.M.T. & BRO. GERMANY' and item number '8809'. Used after 1914. Round version 'G.M.T. 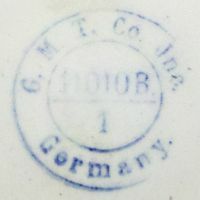 Co., INC. GERMANY', item number '1017/1' with addition 'DEKOR 579' on the left. Used after 1914. Round version with 'G.M.T. 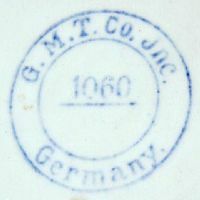 Co., INC. GERMANY' and item number '1060'. Used after 1914. Round version with 'G.M.T. 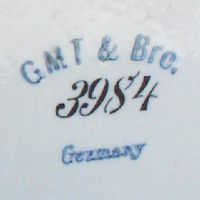 Co., INC. GERMANY' and item number '3998', same item found marked with 'Bro.' before. Used after 1914. Round version with 'G.M.T. 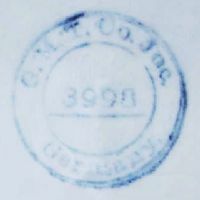 Co., INC. GERMANY' and item number '8809'. Used after 1914. Round version with 'G.M.T. Co., INC. GERMANY' and item/deco number '11010B/1'. Used after 1914. My first encounter with G.M.T. : 'G.M.T. 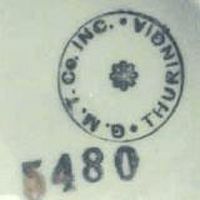 Co. INC. THURINGIA' with the stamped addition '5480'. Used after 1914. Found on a metal item: 'G.M.T. 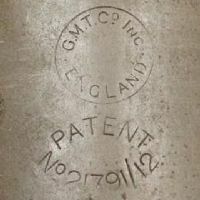 Co. INC. ENGLAND' with 'PATENT No. 2179/12'. Used after 1914. Oval version showing 'G.M.T. Co., INC. GERMANY', the first of this type I ever saw. Used after 1914. Found on a metal item: 'G.M.T. Co. INC. GERMANY'. Used after 1914. 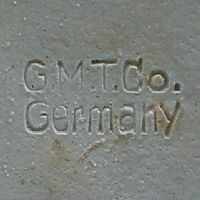 A cast-iron grater, marked 'G.M.T. Co. INC.'. Used around 1960, simple 'G.M.T. 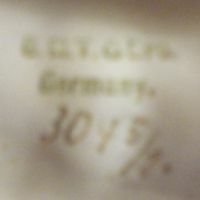 CO.' above 'GERMANY' and item/decoration number '3045/2'. 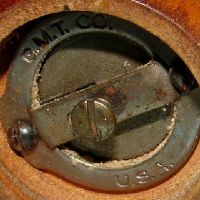 Used around 1960, simple 'G.M.T. 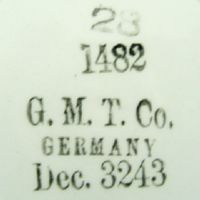 CO.' above 'GERMANY' and item/decoration number '3723-2'. Used around 1960, simple 'G.M.T. CO.' above 'GERMANY', '1482' and decoration number 'DEC. 3243' (see 'Mark Comments' above). 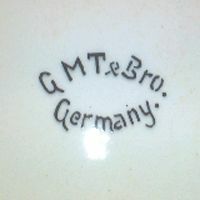 Used around 1960, found on a beer stein: impressed 'G.M.T. CO. GERMANY'. Used around 1960, very simple 'G.M.T. 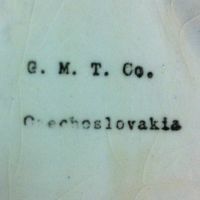 CO.' above 'CZECHOSLOVAKIA'. Used around 1960, found on a pepper grinder: 'G.M.T. CO.' and 'U.S.A.'. Used around 1960, merely 'G.M.T.' and 'GERMANY' in a double ring surrounding the item number 8915. 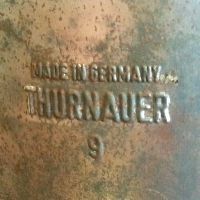 Used around 1970, merely 'MADE IN GERMANY' above 'THURNAUER'.